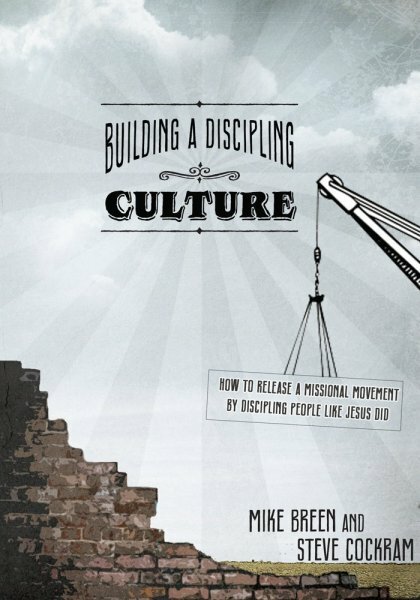 I am reviewing Mike Breen’s book, Building a Discipleship Culture. Breen’s approach to disciple-making and ministry is appealing. So I wanted to blog through the book chapter by chapter. I have really benefitted from the first LifeShape that Mike Breen introduces us to: the Learning Circle. Before we can discuss the Learning Circle, though, I have to first begin by explaining what Breen calls a kairos moment. As Breen says, “Jesus called people to follow him, calling those people disciples, or literally ‘learners.” (Kindle Locations 762-763). The Learning Circle is a tool that helps us slow down and learn from what God is teaching us. Breen begins by distinguishing chronos time from kairos time. Chronos and kairos are two Greek words that can be translated “time,” but Breen uses them to distinguish the normal flow of time (chronos) from an important moment in time (kairos). A kairos moment can be one of many things. It can be a sudden recognition that there is unrepentant sin in your life, a Bible passage that instructs or convicts you, words from a song that dominates your thoughts for the rest of the day, someone’s words to you, etc. Kairos moments can be negative (e.g. realizing you have sinned) or positive (e. g. recognizing that God is calling you to a certain task). The essential thing is the recognition that, whatever the means are, God is using what happened to teach you something. Some of you might think that this sounds overly mystical. I don’t want you to envision this as an invitation to sit in séance and wait for God to move you. It is best, I think, to see a kairos moment as simply the recognition that God is working in your life. Only a Christian deist would struggle with this. The Learning Circle, which is the first LifeShape to which Breen introduces us, is how we respond to a kairos moment. We constantly see God working in our lives, but we still have to stop and respond to them. Breen has several unconvincing Biblical examples of this, but I have found the most helpful Biblical example to be one he does not use: Jesus calming the storm in Mark 4:35-41. Jesus calms the storm, which is clearly an act of God. And God was using that event to teach them something about Jesus. So the disciples were faced with a choice: either they could ignore what had happened or reflect deeply on what God was teaching them. Breen rightfully thinks that a crucial part of discipling someone is to teach them to reflect deeply on what God is teaching them. The Learning Circle provides us with the structure to do that. The Learning Circle has six steps. Observe: You first need to notice that God is teaching you something and observe that moment (or series of moments) thoroughly. Reflect: Reflect upon the Kairos Moment. The goal is to clarify what God is trying to teach you through it. Discuss: Breen wants you to discuss your Kairos Moments with other Christians. This can take place, unsurprisingly, in a Huddle for discipling leaders. 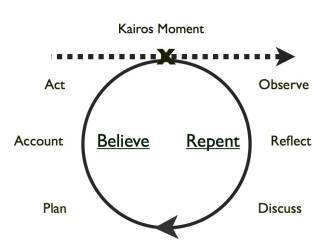 The Believe part of the process of learning from a Kairos Moment has three parts. Plan: We need to discern some way that we can follow what God is teaching us. This can be to have a conversation with someone, to confess a sin, to read the Bible every morning, to reduce our commitments, and so on. Account: Breen sees these things taking place within the context of a group of Christians, specifically in a Huddle or some form of discipling group. When we decide how we can put into practice what God is teaching us, then we need to make use of the fellowship and set up accountability. Act: Go and do the plan you’d created. Though I have benefited from Breen’s teachings on kairos moments and the Learning Circle, I do have several concerns. I think we can utilize the Learning Circle. We just need to be cautious. First, I find Breen’s Biblical exegesis to support this LifeShape to be lacking. It feels to me like Breen just found the Learning Circle useful and tried to find ways to work it into the Bible. His go-to passage about Jesus calling people to repent and believe does not support the Learning Circle or even his understanding of Kairos moments. Jesus wasn’t teaching that in that verse. Second, Breen writes as if he is presenting the very ideas of Jesus to us. You can find the six steps of the Learning Circle if you just look in the right places. As I said in my first reservation about Breen’s teachings, I don’t think his exegesis actually works. When he presents it as a teaching of Jesus, then things become less flexible and more dogmatic. I think people should view this as a tool that’s optional, not as a teaching of Jesus that is required. Finally, I have reservations about getting too comfortable with declaring what God is telling you to do. I don’t want anyone getting comfortable attributing things to God that He might not be saying. Yes, we need to be examining our lives and trying to grow as Christians. And, yes, I think God works in our lives. But we can be wrong or self-deceived. Identifying Kairos moments needs to be done with a touch of trepidation. As I said at the beginning, I have found this a powerful tool to teach people to discern how God is working in their lives. So many of us grew up in churches where we just didn’t expect God to be active in our lives. And this LifeShape can powerfully help us grow to learn about it.